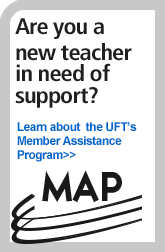 Since its inception, the UFT has made reducing class size a priority so our members can give each child more individual attention. Early on, when classes often exceeded 40, we won class-size limits in the contract: usually 32 in elementary grades, 33 in intermediate schools, (30 in Title 1 intermediate schools) and 34 in high schools. Class size is 25 in kindergarten and 18 in pre-K. Tell your UFT chapter leader if your class(es) exceed(s) these limits.